Since time immemorial, mountains have held special meaning to humans, and coming from a place where the tallest point in the landscape was a measly 169m high, I took the first available opportunity to visit the most accessible mountain when I arrived in Hobart. Thus began my love affair with Mt Wellington. Mt Wellington became my outdoor classroom. I frequented the walking tracks on mountain but I never walked far due to my photographic compulsions. Whatever little distance I managed to cover on foot was sufficient to convince me of the diversity of botanical life on the mountain. Browsing through the scientific literature, I was amazed to discover that the Mt Wellington Range was a stronghold for about a third of Tasmania’s higher plants and up to 60% of Tasmania’s bryophyte flora. I was duly impressed. Appreciation grew. I was duly impressed and intrigued. Members of the sunflower family (Asteraceae) such as daisies and groundsels are usually thought of as herbs, particularly in European countries, but then in temperate Australia, tree daisies appear to be a common theme. I learnt later that the tree was named after famed Scottish botanist Robert Brown, hence the specific epithet ‘brunonis‘. Vernacularly, the tree was known variously as the Tree Groundsel, Tasmanian Daisytree or Brown’s Tree Daisy. 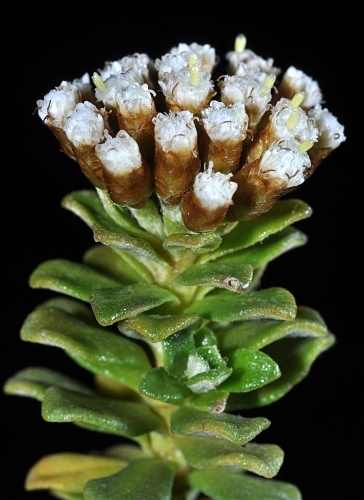 Interestingly, the only other species of Brachyglottis occur in New Zealand. My reveries on daisytrees were short-lived in the face of academic pressures. Visits to the mountain trickled. The final year of my undergraduate studies arrived and one academic unit which piqued my interest was Plant Science Research, in which I would get a chance to try out a mini-project of my own. 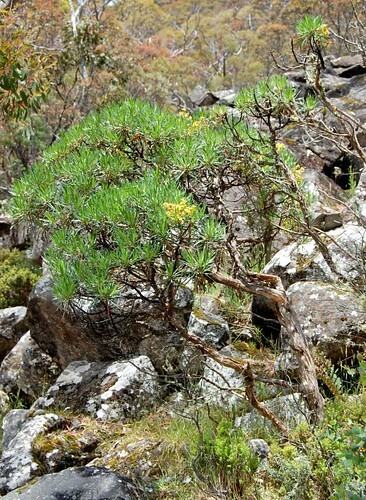 I toyed with the notion of studying a rare or endemic plants and I felt again the call of the mountain, and remembered the Tasmanian Daisytree, which was both rare and endemic. I sought Rob out and he graciously agreed supervise me on the academic endeavour. We fine-tuned the objectives of the study, which would be to furnish an explanation on why the Tasmanian Daisytree is rare within it’s habitat range. 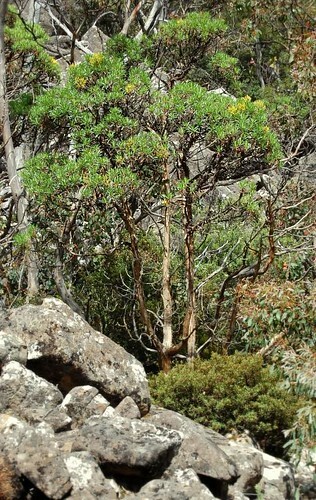 The Tasmanian Daisytree is limited to Mt Wellington and a few other nearby locations. It’s distribution does not exceed 50 square kilometers and it is further restricted only to subalpine woodlands. In it’s habitat, it is also found scattered in a very disjointed manner and there was no obvious reason why this should be so since the subalpine habitat was apparently rather uniform. When we eventually analysed the data we collected and compared the vegetation and environmental factors of areas with and without the Tasmanian Daisytree, little useful information emerged. Areas with and without the Tasmanian Daisytree were not extremely different in terms of their vegetation or environment. Other forces must be responsible for preventing the Tasmanian Daisytree from attaining ubiquity! As far as speculations go, the Tasmanian Daisytree is probably stopped cold in it’s tracks at the seed or seedling stage. We did notice in our preliminary surveys that seedlings of the tree daisy were exceedingly rare. Limited as the study was, more questions were raised than answered, which is, as I have come to believe, a trend that drives the heartbeat of scientific inquiry. Why the Tasmanian Daisytree chooses to be where it is may remain a mystery for some time and I hope to see one day when I sleuth through the scientific literature, a paper on the lines of: Towards an explanation of the rarity of Brachyglottis brunonis. 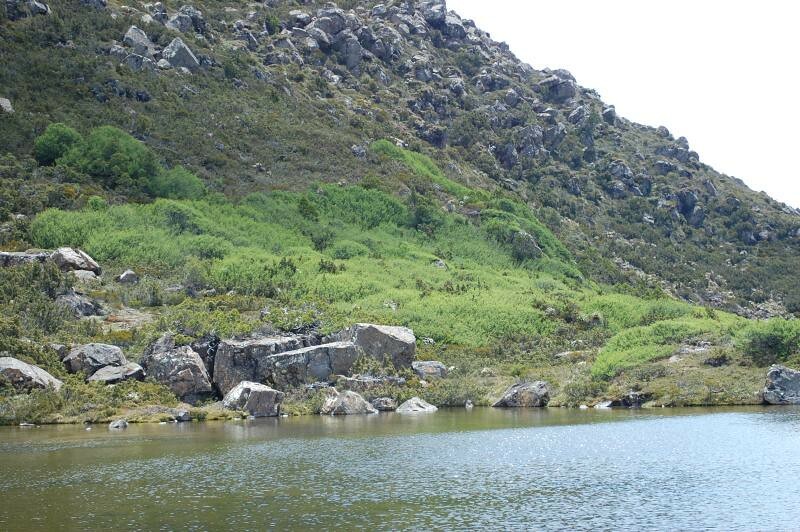 In all likelihood, the Tasmanian Daisytree originated on the mountain, and has never managed to move far. It’s rarity only serves to endear one to it’s presence, and presents the all so pleasurable challenge of spotting it among the ocean of other common plants. I can see the Tasmanian Daisytree as no less than the mascot tree of Mt Wellington, the prime botanical feature of Hobart’s Table Mountain. I imagine that the great nature photographer Peter Dombrovskis might thought similarly of the iconic status of the Tasmanian Daisytree when he immortalized in one of his great photographs, a scene of the tree against a backdrop of the weathered face of the Organ Pipes that so characterizes the mountain. As an ex-student in the School of Plant Science of the University of Tasmania, I was inducted through a training ground, a first year botany laboratory, which bore the name of Winifred Mary Curtis. Then later when my pursuit of botany became more specialized, in the form of looking at bryophytes (mosses and liverworts), I had the privilege of staring down the very same microscope that Winifred Curtis used. But who was this lady centurion who had touched generations of botanists before me, and whose influence is still felt today by participants of the Tasmanian botanical culture, through her forever immortalized magnum opus on Tasmanian Plants, The Student’s Flora of Tasmania. Winifred was born 15 June 1905 in London, the only child of Herbert John Curtis and Elizabeth Winifred Curtis (née Baker). She studied science at University College, London from 1924, winning various awards and scholarships and ultimately completed her undergraduate studies with an honours degree in 1928. In 1939 she emigrated to Australia with her family and initially worked as a science teacher at a private girls’ school in Hobart. Later, she joined the Department of Biology at the University of Tasmania and was part of the pioneering team that established the Department of Botany there in 1945. On that account alone, she is indisputably the matriarch of Tasmanian botany. In 1943 she started work on The Students’ Flora of Tasmania, the standard text which superseded Leonard Rodway’s Flora of Tasmania, and which remains frequently used reference. From the early 1960s much of the work on the Student’s Flora involved a close collaboration with botanical collector and artist Dennis Ivor Morris (1924 – 2005). Concurrently, Winifred was also interested in the genetics and cytology of plants. In 1944 she published a milestone piece of work on the Variations in Pultenaea juniperina, which represented the first record of polyploidy in an Australian native plant. This led to her PhD from London University which was awarded in 1950. Her doctoral thesis was titled Studies in Experimental Taxonomy and Variation in Certain Tasmanian Plants which was a pioneering work in cytology and polyploidy. Her published works on the topic were later sent to the University of London for which Winifred received a Doctor of Science degree in 1968. 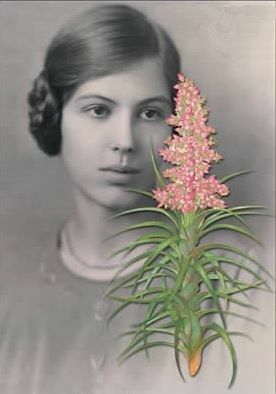 During her stint in the Department of Botany, she rose through the ranks to become a Senior Lecturer in Botany in 1951 and later a Reader in Botany in 1956, the most senior position held by a woman at the university at that time. She also acted as Head of the Department on several occasions. Dr. Curtis retired from the Department of Botany in 1966 and was appointed Honorary Research Fellow; she was made an Honorary Research Associate in the Department of Plant Science in 1998. Retirement did not stop Winifred from working. From 1967 to 1978 she wrote the six-volume The Endemic Flora of Tasmania, a classic in Tasmanian botany features sublime illustrations by botanical artist Margaret Stones. In the late 70s, she was instrumental in setting up the Tasmanian Herbarium at the locality it currently stands in Sandy Bay, in proximity of the Plant Science Department of the University of Tasmania. Also, the final volume of the Student’s Flora on monocots (grasses, lilies and related plants) was also published in 1994, 30 years after she retired, and over half a century after the commencement of the Student’s Flora series. Winifred Curtis lived to the ripe age of 100 and died on October 14, 2005. 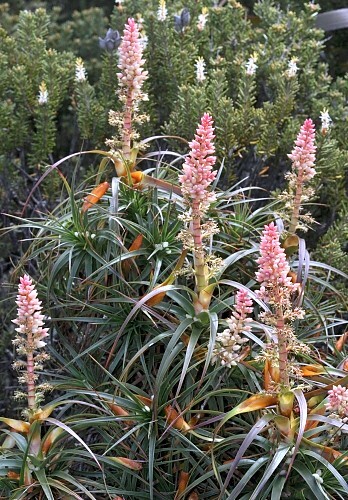 The legacy of the matriarch of Tasmania’s botany lives on in the leading botanists of today, most of which were her students or students of her students and her name has also been immortalized in plants such as Richea x curtisiae, Epacris curtisiae and Epilobium curtisiae. If I should have any regrets of my time in the School of Plant Science, it would be that I never got to meet Dr Curtis. I must be content however for the vast scope of her work; the Curtis award that continues to be bestowed on generations of first year botanists (of which I was a lucky recipient); and the privilege to have looked through the lens she had used on the plants she lovingly studied. 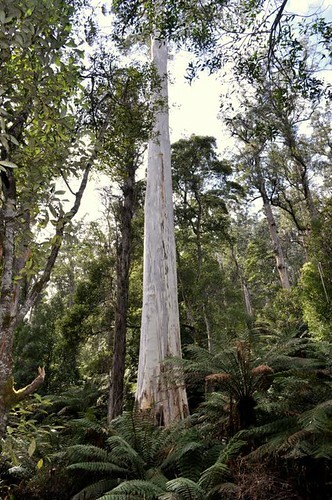 It is common knowledge that the Mountain Ash (Eucalyptus regnans) is the worlds tallest flowering tree and that Tasmania has some of Australia’s tallest old growth forests. So magnificent are the Mountain Ashes that significant individuals have earned appellations such as ‘Centurion’ and ‘Methuselah’. Alas, the legend of the Mountain Ashes have overshadowed the other giants that reside in Tasmania. There are other giants among the eucalypts that are worthy of more general recognition, and it may come as a surprise to some that the White Gum (Eucalyptus viminalis) is one of them. Practically every plant enthusiast in Tasmania and many tourists who visit the state has seen the grand Mountain Ashes of the Styx or the Tarkine. 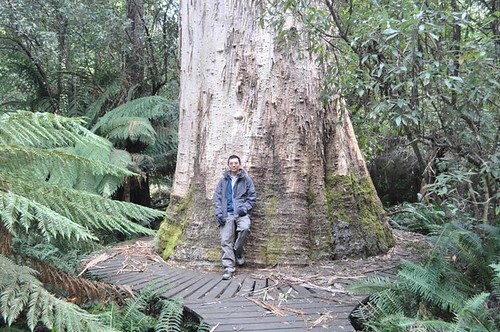 Few however, even among Tasmanian botanists, have met or are even aware of the giant White Gums of Tasmania’s Northeast. This is because White Gums are often thought of as average sized trees associated with dry forest. Yet, in the Evercreech Forest Reserve just 10km from Fingal, a forest of giantic white gums, locally called White Knights, preside over the wet forests. For centuries they have watched, like silent sentinels from their statuesque vantage point, the changing landscape of Tasmania’s Northeast. The time is nigh for the White Knights to take their rightful place in the annals of Tasmania’s rich botanical heritage, for nowhere else in the world does one encounter white colossuses such as these. In the 1970s a forester named Des Howe was carrying out a routine survey in the forest about to be fell when he noticed that one of the trees that was to be felled was very tall. A surveyor came in and measured the tree to be an incredible 91m. A more accurate measurement of 89m was later given in the gianttrees website. Girth-wise, the White Knight is just as impressive, being 3.3m in diameter. The White Knight is also believed to be over 300 years old. Due to the presence of the White Knight, 52 hectares in the area was made a forest reserve to preserve the White Knight and other giant White Gums that reside there. The story goes that botanists initially did not believe that the tall tree reported by the Forestry Commission was a White Gum until leaf and fruit specimens were brought before them. Likewise for me, my experience of the white gum being a average size tree of dry forest was so ingrained that I would have scarcely believed that the White Knights were White Gums until I saw the characteristic seed capsules myself. It is not difficult to see how the first foresters who came before the presence of the giant white gums likened the trees to Knights, perhaps spotting shiny-clad armour. White has always been the colour of purity and goodness, and there is nothing quite like the sight of Brobdingnagian white boles standing in blazing contrast to a deep green forest understorey. And I am properly awed and impressed, just as the visitors before me that have come to pay their obeisance to the White Knights. A foray into the history of Tasmanian botany brought me to a website featuring what is perhaps the very first botanical-naturalist publication of Tasmania, a century old book titled Some Wildflowers of Tasmania (1910) by Leonard Rodway. I had learned in my undergraduate years that Leonard Rodway was the head of the first herbarium, but this piece of information was anecdotal at best. There was much more to the man than just the ‘head of the herbarium’. Leonard Rodway was born in 1853 in England to a dentist Henry Baron Rodway and his wife Elizabeth. He first trained to be a midshipman but eventually followed his father into dentistry. He migrated to Queensland and later Tasmania and was subsequently registered under the first Tasmanian dental act in 1884. Dentist by trade, Rodway pursued plants during his weekends and holidays and in 1896 became the honorary government botanist. A self-made authority on Tasmanian plants, Rodway published prolifically in the Royal Society of Tasmania. His magnum opus The Tasmania flora was published in 1903, and became the standard reference on the topic for 40 years until the era of Winifred Curtis began (which shall be covered in another post). Rodway also published a series of monographs, the Tasmanian Bryophyta, between (1912-1916) which, although outdated, still stands as the most complete work on Tasmanian bryophytes by a single author. 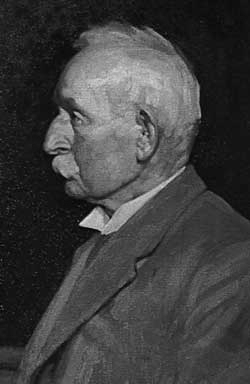 Rodway retired from public life in 1932 and passed away in 1936, aged 83. In a time when the study, teaching and application of botany depended on the initiative of individuals and voluntary organizations, Leonard Rodway single-handedly raised and sustained the ford of Tasmanian botany. In that respect, it would not be too inaccurate to title him “the founder of Tasmanian botany”. Rodway’s botanical achievements have been described as ‘a true gift to the people of Tasmania’. Several plant and fungal species bear the specific epithet rodwayi in his honour (examples are Eucalyptus rodwayi, Gahnia rodwayi, Entoloma rodwayi) and a number physical features in the Tasmanian highlands (eg. Rodway’s Pass in Mt Field National Park) perpetuate his memory. For the student of botany though, Rodway’s name will always be remembered through verbal transmission, when instructors of field botany pronounce the names of plants which immortalize Rodway. It is most remiss of me, that I should write of one of Tasmania’s most iconic trees only now, after more than a year of blogging about Tasmania’s fantastic flora. 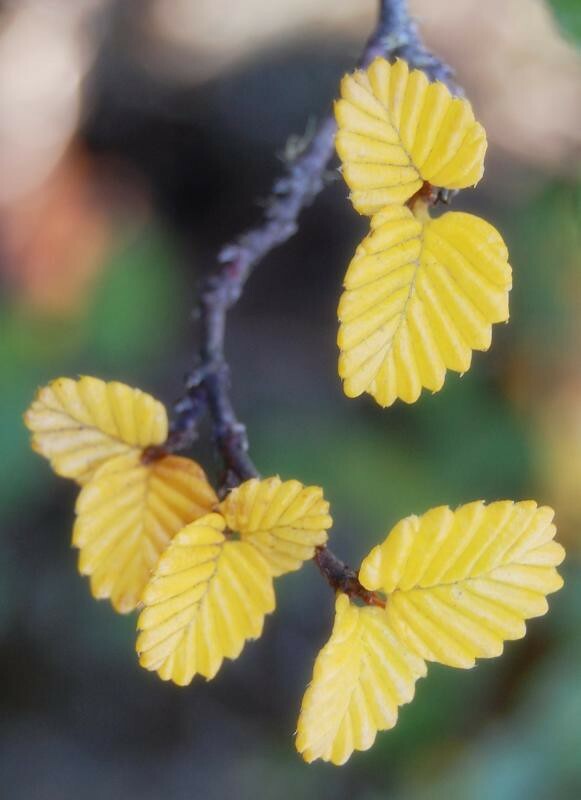 Introducing a tree that needs little introduction – Tasmania’s one and only deciduous native tree, the inimitable Nothofagus gunnii, the Deciduous beech, the Tanglefoot. There are those too, who simply call it the Fagus. The Deciduous beech is a small tree from the beech family (Fagaceae). It reaches little more than 2 meters at the slightly lower altitudes but practically sprawls over boulders in the alpine zones. 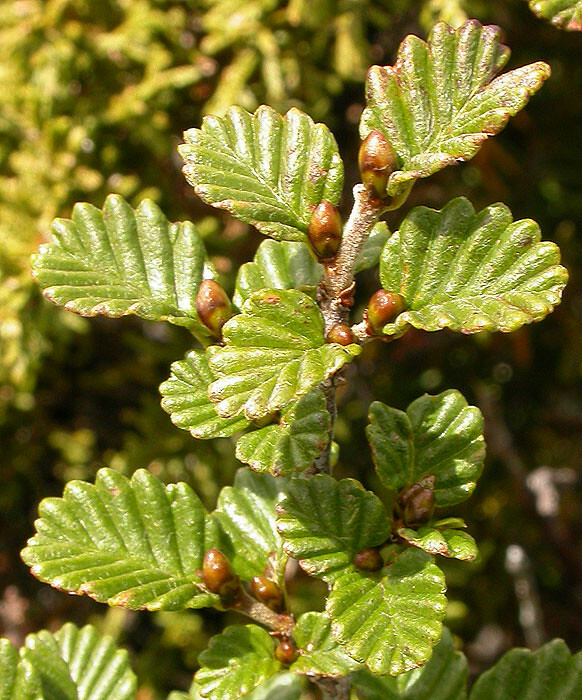 It is a mere dwarf compared to it’s much more widespread relative, the Myrtle beech (Nothofagus cunninghamii). The legacy of the Deciduous beech however predates that of the Myrtle beech. As far as geological time is concerned, the latter is a much younger player in the biogeographical game. very similar species were in Antarctica before Australia separated from that now snowed out landmass. 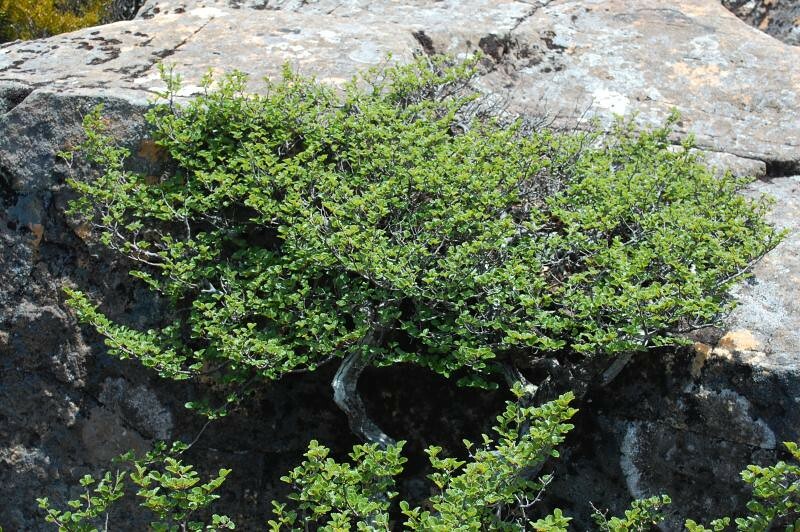 The deciduous nature of N. gunnii also leads one to think that deciduous-ness might have been a much more common feature of the Tasmanian tree flora in times past. Alas, this is not really the easiest plant to visit. 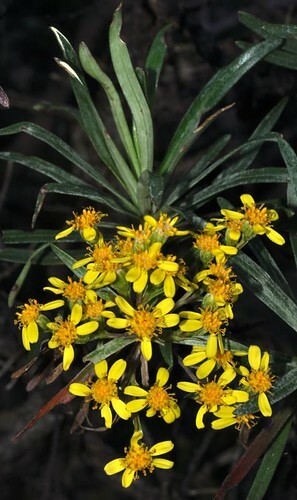 The Royal Tasmanian Botanic Gardens (RTBG) has at least one specimen, but it is a small one hardly more than 50cm tall, and it is largely obscured by other plants. Obscured! That’s criminal, particularly given that an illustration of the deciduous beech graces the signboard at the entrance of the RTBG. Still, that is one of the closest places to civilization that one may visit this icon. Most understandably, the Deciduous beech must be one of Tasmania’s most difficult-to-cultivate icon. It takes a long time to grow, if it even survives. 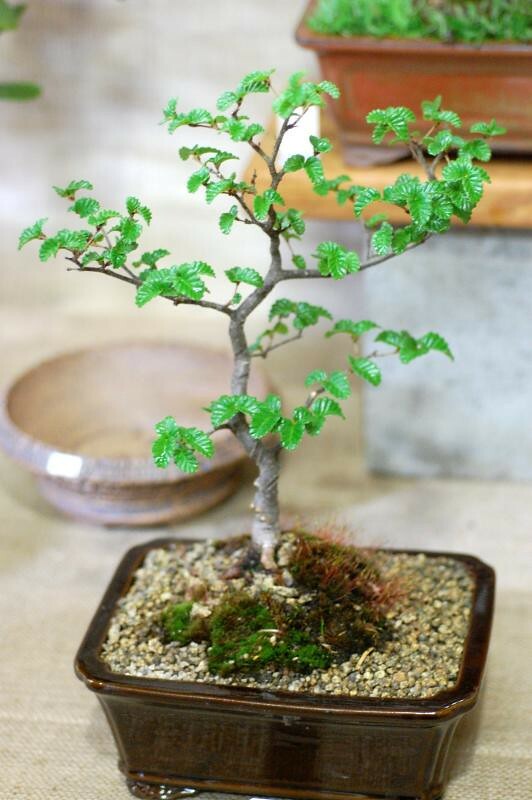 Still, once it harmonizes with a sincere plants-person, a most exquisite bonsai plant the Deciduous beech will make. But the connoisseur will seek the Deciduous beech in it’s highest abode. The true seeker must travel to the mountains to the west, during April of the Austral fall. They must drive west bound, up windy beaten roads, through the grand forest of the Mountain Ash. And where the road ends by the Dobson Lake, they must by foot alone traverse boulder and tarn, beyond where the highland gums surrenders to frost and exposure. Then, and only then, does the sincere seeker arrive at the Tarn shelf, a true mecca of nival endemicity, where the deciduous beech basks upon the alpine boulders in it’s most exposed, most brazen magnificence. And then one may say that one has witnessed the leaf fall of the last of Tasmania’s deciduous, the yellow of the autumn Fagus. I have been silent, like the plants I study. There is no easy way to state this so I state it simply. Swiftly but surely, my time in Tasmania has come to an end. Five years I have been in Tasmania, the plant life there has left an indelible mark on my psyche. Such are the ways of plants. They enter ones awareness in the most unobtrusive of ways. And they leave a void in their absence. But this void is meant to be. There can be no one who is touched by the grace of botanical beauty who will fail to strive towards attaining another glimpse of that drunken ecstasy. The ecstasy of seeing yet another plant that I have never laid eyes upon, smell yet another Christmas mint, see the heath blossoms emerge for yet another year, and yet another year. Five years in Tasmania. A lifetime of memories. Memories of flowers. Memories of ferns. Memories of trees. And most of all, memories of the people whom have imparted to me their very own affection for plants, even though they might not have said so in as revealing a fashion. I will continue to write of the plants of beautiful Tasmania, if only to commemorate the loveliness of her flora, but every post must necessarily now be one written from a great distance – a distance that make the heart grow fonder.